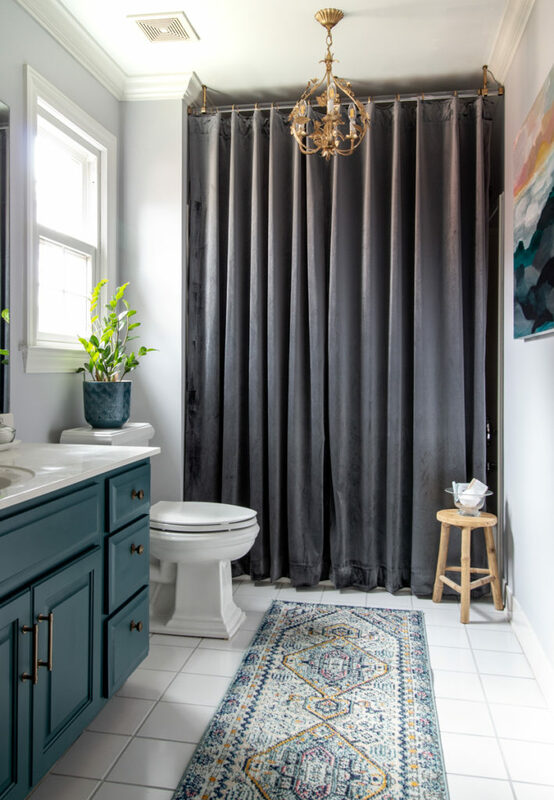 As promised, I am back to share resources and more details about the Bathroom Reveal I shared last week. Friends, I have to thank you for all of your positive and sweet comments on this budget friendly makeover. 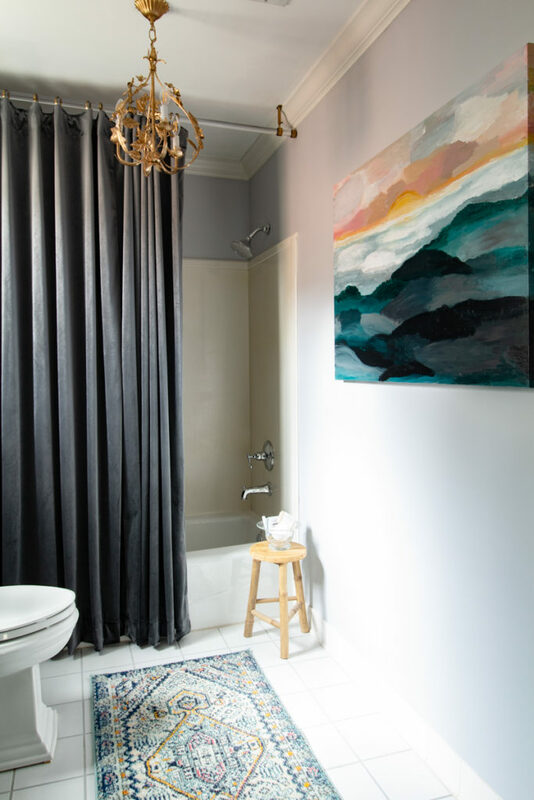 Not every bathroom requires, nor does your budget allow, for a complete gut renovation. 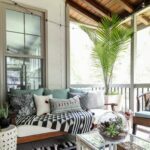 I hope this project proves that basic DIY with high-quality paint and budget-friendly decorating can completely reinvigorate a tired space! opinions and photos are my own. This post contains affilaite links for your convenience. Once I began shopping for my KILZ Tribute paint samples at Build.com, I realized I could get everything I needed to transform the rest of the room from this one resource! This was important to me because just weeks before we had adopted our Irish Doodle puppy, Freddie. Training him was my top priority so I didn’t have time to shop around town for this project. 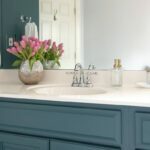 My top tips for designing and sourcing your bathroom renovation online is at the end of the post. 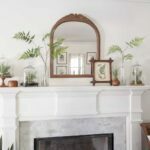 Once I had a design plan, I could find the perfect elements and order every beautiful detail from the comfort of my sofa, with a sweet puppy in my lap! 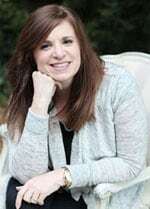 Within a few days of placing my order I had everything I needed to begin my makeover. 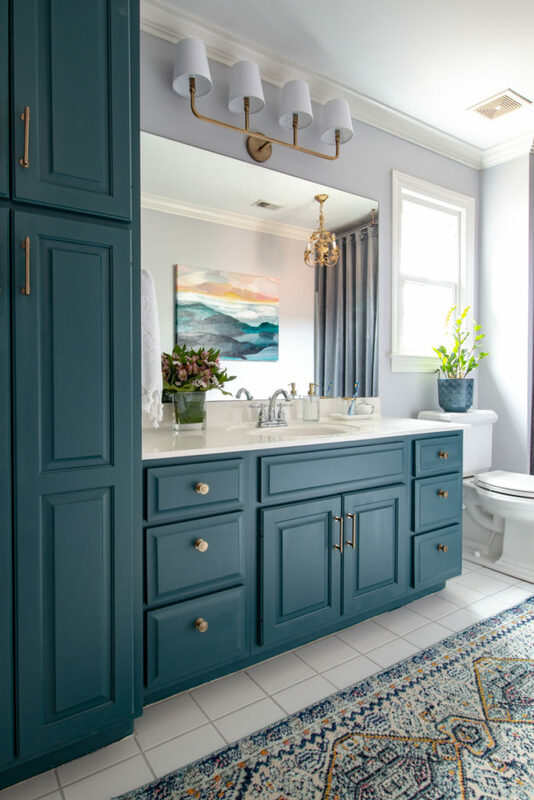 Build.com has a vast selection of styles and brands of everything you need, especially faucets and bathroom fixtures at extremely affordable prices. 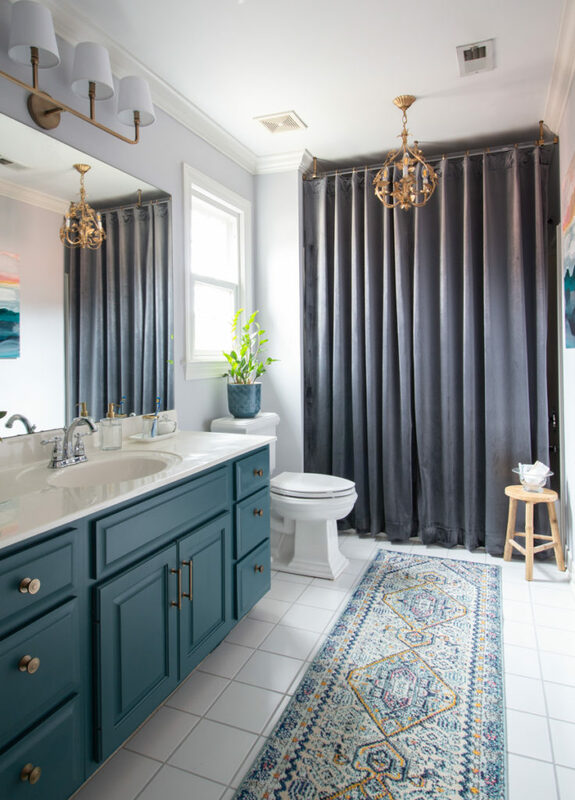 I chose the Kohler Kelston Collection to outfit our daughter’s bathroom. 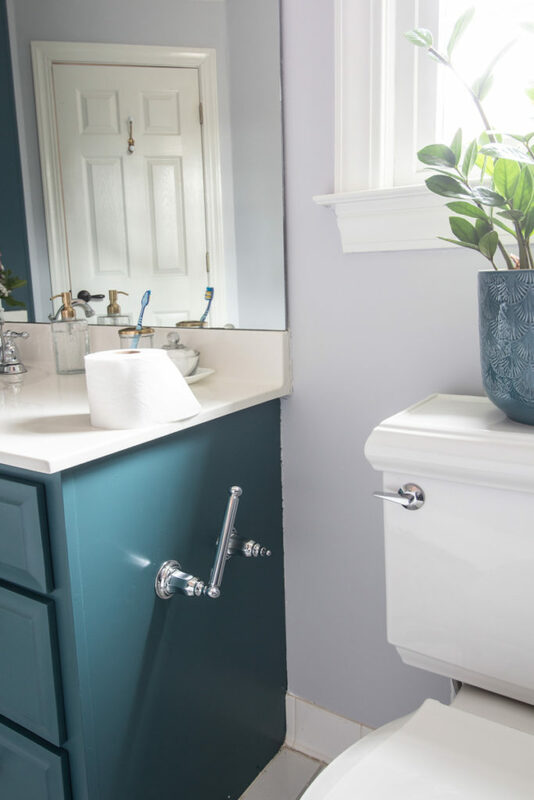 This centerset faucet fit the existing sink style but still had that modern high neck and turned traditional handles that I love. I know she will love the matching double post toilet paper holder that features this easy to use, pivoting design. No more fumbling with a spring rod to change a roll of toilet paper! 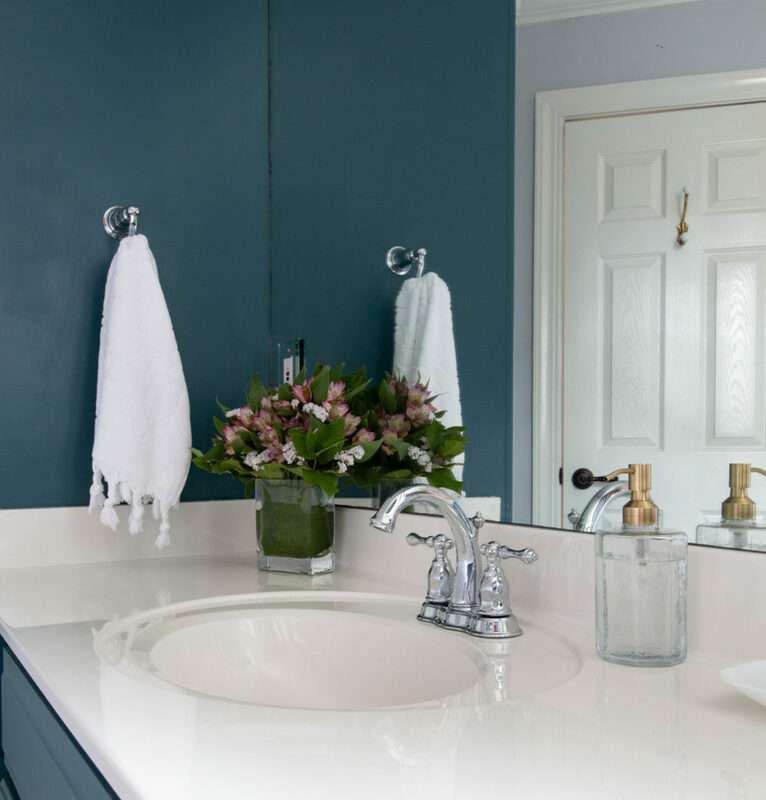 The simplicity of a robe hook for a hand towel at the sink is not only effortless in use but beautifully clean in appearance too. And can we talk about this lighting? 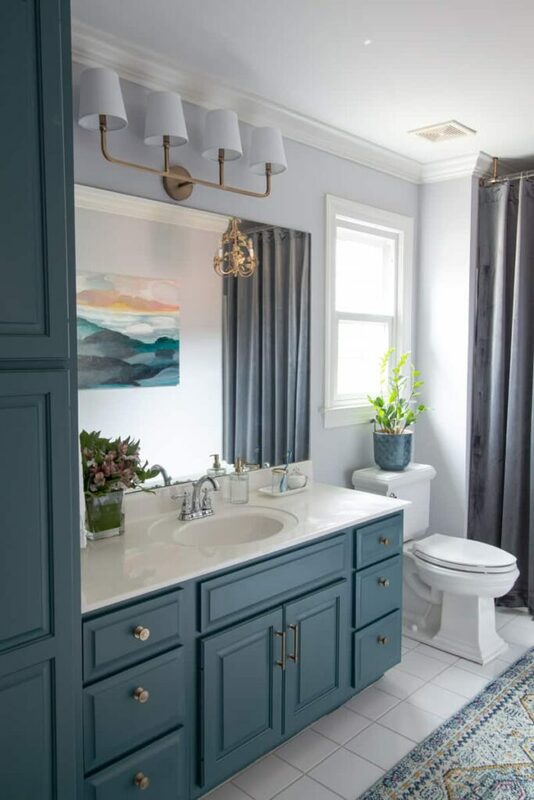 I nearly gasped when I saw this four light fixture scroll into view. 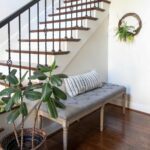 Build.com has a vast selection of lighting. 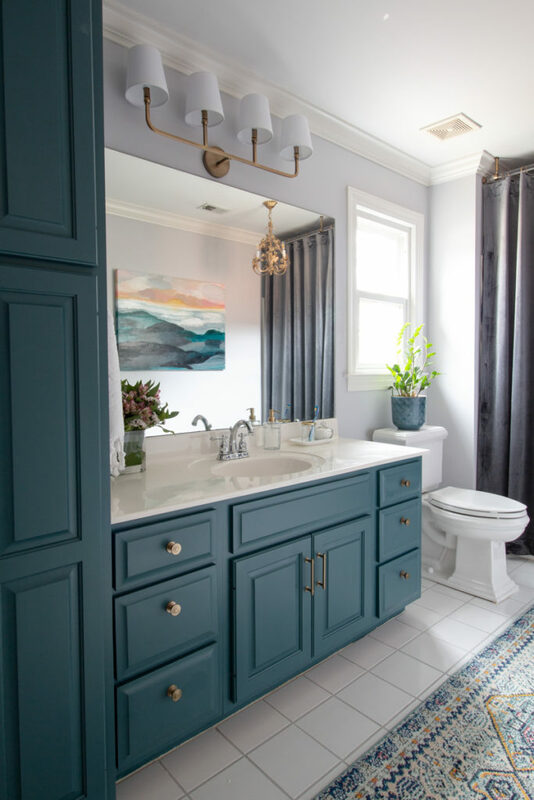 It can be difficult to find a light fixture with the perfect interpretation of a modern, yet traditional fixture. Previously, the light above this oversized mirror was just a three light fixture. Upgrading to four lights was the right choice not only for extra lighting but also was a better fit to the scale of the mirror beneath. 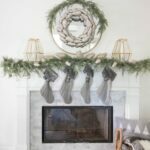 You might be as surprised as I was to learn that Build.com not only has the basics for remodeling projects but also a complete line of home decor. This Loloi Nadinn runner was absolutely perfect for the color palette I had chosen. It is beautifully made and reasonably priced for such high-quality. To demonstrate how easy it was to shop and come up with a cohesive plan I thought I’d share my actual Favorites page on Build.com. All of the links below are clickable affiliate links. 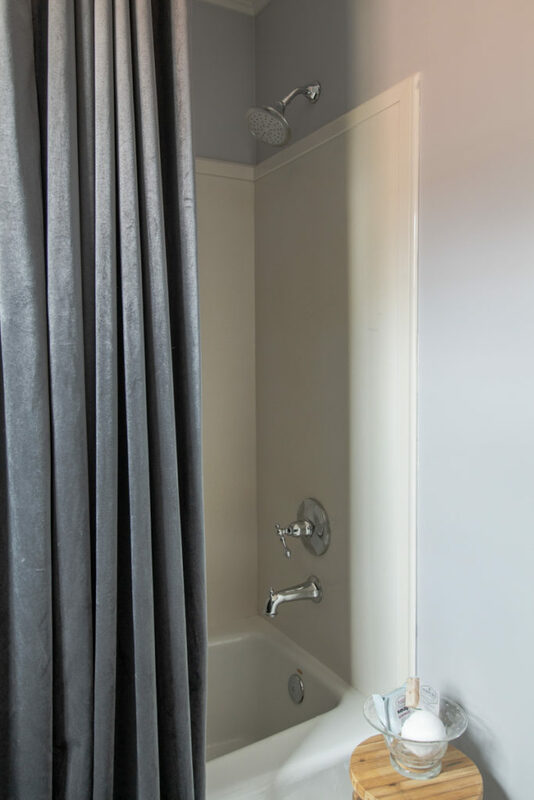 The custom velvet shower curtain and acrylic rod were a special design detail that I will share more about in separate post, but of course, Build.com has a wide selection of single and double shower curtain rods as well. 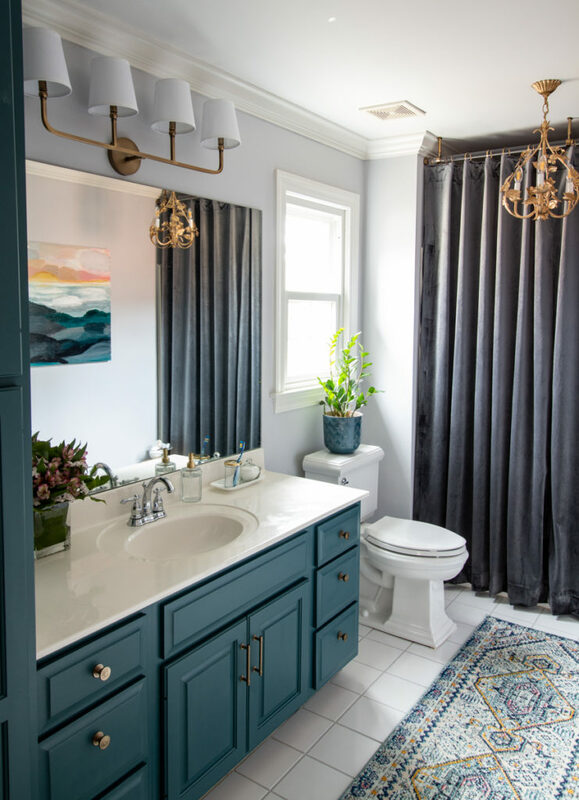 My designs almost always include something thrifted and or vintage and I think this floral inspired chandelier adds the perfect amount of glamour to this bathroom. 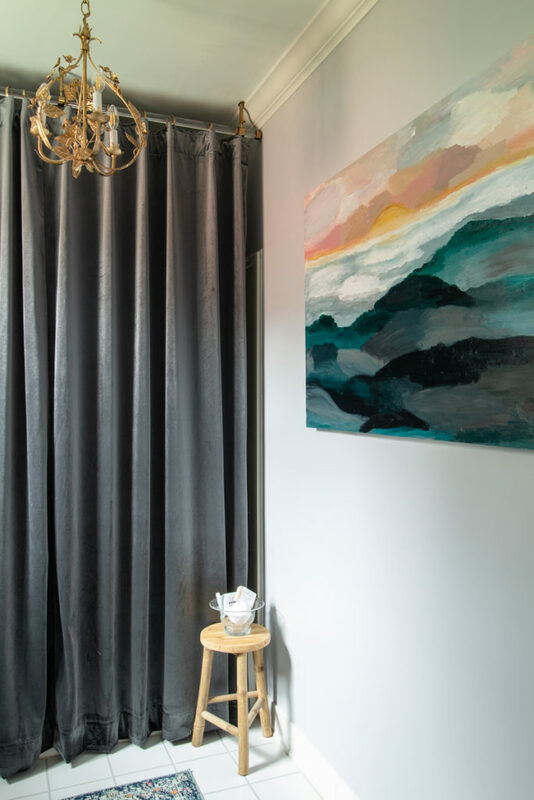 To further personalize her space, I painted an abstract landscape inspired by our family Haleakala sunrise and bike trip on Maui. 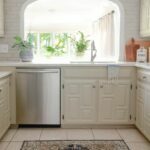 Here are a few more tips for shopping for a renovation online. Have a plan. 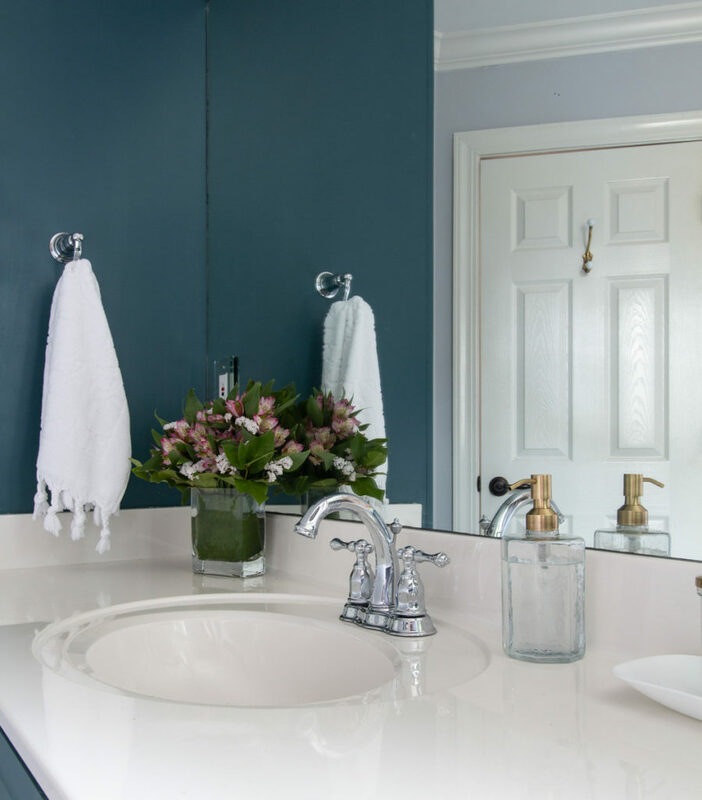 Decide on a color scheme and search for what you need to bring that plan to life. Your online shopping cart can begin to look a like a design board. 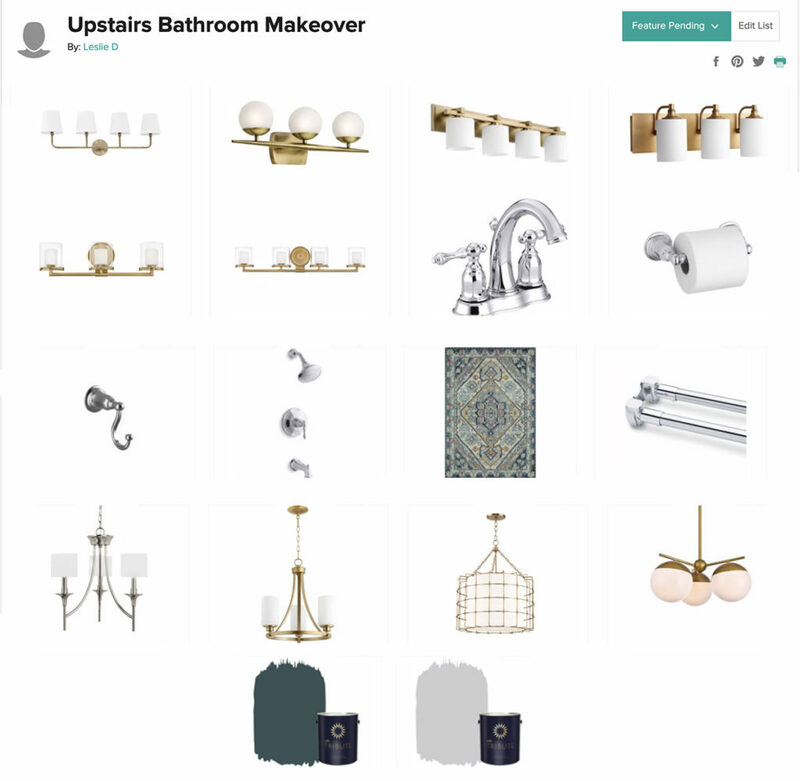 On Build.com, after you set up an account, you can save all of your potential pieces and parts of your renovation to your Favorites Board. Shopping for everything at once will help you stay on budget. Once you have set a realistic budget, you can choose what items are most important to you and your design. Then you can allocate more of your budget dollars to those items. Don’t forget the small details. 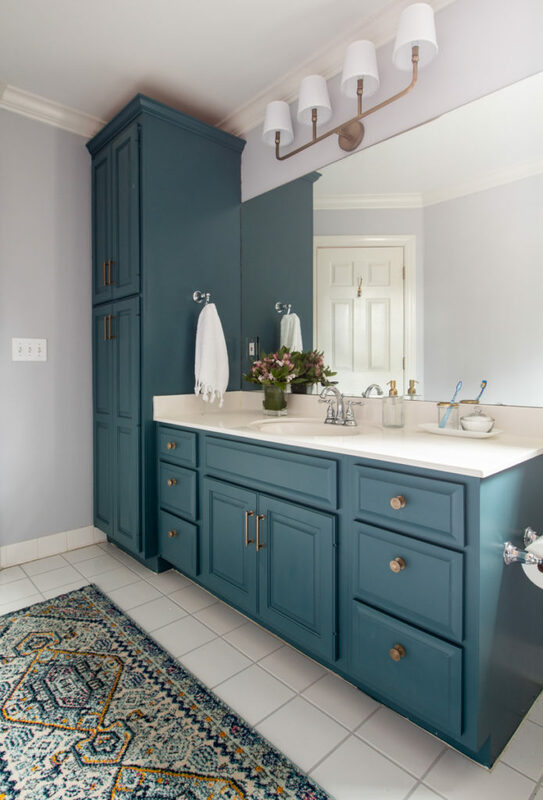 Bathrooms are more than just faucets, vanities, and bathtubs! Express your style with lighting and rugs and the finishing details. Explore different finishes. Don’t be afraid to mix gold and chrome finishes. The end result is more dynamic and not so matchy-matchy. 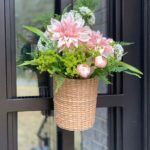 It also opens the opportunity to consider what elements you might be able to keep and work with in your newly imagined space. 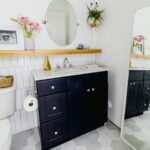 I hope this bathroom makeover proves it can be a painless process to design and makeover a bathroom on a budget and do so online! 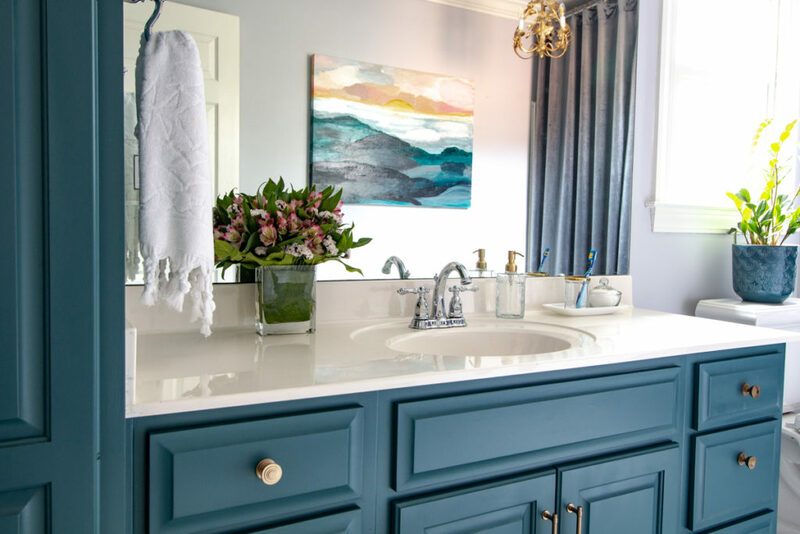 For more a complete how-to for painting the cabinets visit this blog post tutorial. Love the painting! Will there be a tutorial on that? You are so talented. Your daughter is a lucky young lady!